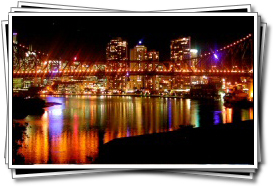 Over the years Brisbane has developed from its humble beginnings as a penal colony for the rejects of British society into a very active and lively cosmopolitan city of 1.5 million. There is no denying that the Brisbane of today is a stunning city, modern, bright and open under a painter's blue sky. The city has a great deal to offer the recreational visitor, with a good street café scene, riverside park areas, a busy cultural calendar that has included international sporting events and an excellent nightlife. The combination of 'fun and sun' is always the main appeal of the city but it is also the arts capital of Queensland, with dozens of galleries, museums, theatres, cinemas and even concert halls. The range of restaurants, attractions and nightlife should satisfy any adult, the beaches beckon the lively or the sunworshipper, and there is a range of venues for children. One of these, the Lone Pine Koala Sanctuary, is home to a wide variety of Australian wildlife, including kangaroos, possums, wombats, emus and lyrebirds and of course over 100 ever-huggable koalas. 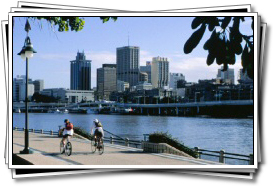 The only problem for any visitor to Brisbane is thinking of reasons to return home afterwards. Queensland is perhaps one of the most wonderful holiday destinations in the world. The state has a lush natural environment and range of coastal resorts, from the subtropical south to the perennially warm tropical north. A short drive south of Brisbane are the famous beaches of the Gold Coast and the exciting city of Surfer's Paradise. Widely viewed as one of Australia's entertainment capitals, Surfer's Paradise has a huge range of attractions and international entertainment and is one of the most popular places for Australians themselves to holiday. Click here for more about the Gold Coast. To the north of Brisbane but also within easy driving distance is the Sunshine Coast, with unspoiled beaches and countless subtropical islands just off the shoreline. This area is a welcoming paradise to visit and explore at any time of year, thanks to its famously ideal climate. Brisbane in southern Queensland enjoys slightly drier summers in comparison to the tropical north. Even in winter the surf and beaches remain popular with temperatures in Brisbane averaging around 20°C.